The CX22 is an economically priced Olympus microscope that achieves a high standard of optical and mechanical quality for educational applications. The binocular head is inclined and features Olympus WF 10x eyepieces. Simple enough for even first-time microscope users to master, the CX22 achieves a high standard of optical and mechanical quality for educational microscopes. Conveniently placed controls and a slim base make for comfortable viewing and efficient adjustments. A graduated mechanical stage is included for precise slide movement. Olympus NEA LB optics ensure bright, clear images, they include with this setup 4x, 10x, 40x and 100x objectives. The substage is an Abbe Condenser 1.25 N.A with rack & pinion movement. A 6v 20w variable halogen illumination system provides for ample illumination for any application. This microscope is ideal for educational and medical school applications and comes with a five year warranty. 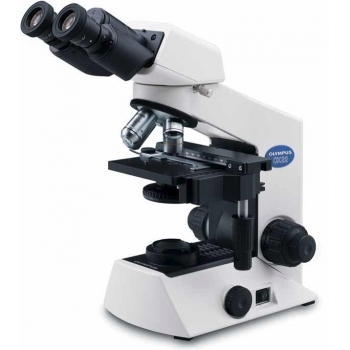 Click the button below to add the Olympus CX22 Binocular Microscope to your wish list.